The New HS 120 3 wheel mini travel scooter - the Ultimate in portability and affordability has arrived! The new HS 120 is loaded with all of the standard features of a small travel scooter with the durability of a mid size 3 wheel scooter. 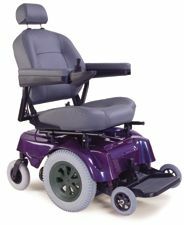 The 8" tires allow for increased ground clearance and the removable battery pack give you the ultimate in convenience. 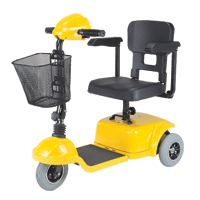 The seat is removable and the tiller folds down, allowing ease of transport in most any vehicle, without the re-assembly hassle of most scooters. Breaks down for easy transport-even in small trunks! Wheel Size Front & Rear -8"
Total Weight (w/o Batteries) 62.5 lbs.